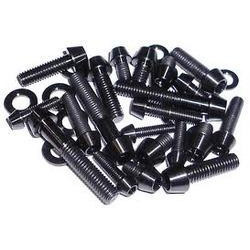 We feel proud to introduce ourselves as one of the well-known manufacturers, exporters, suppliers, importers, wholesalers and traders of Alloy Steel Fastener. The offered alloy steel fastener is a very unique device for the mechanical fastening of two objects. Our supplied alloy steel fastener is acclaimed for providing a perfectly fastened joint. The wholesaled alloy steel fastener is available at very cost effective market selling price. We are one of the well-known manufacturers, exporters, suppliers, importers, wholesalers and traders of Stainless Steel Fastener. 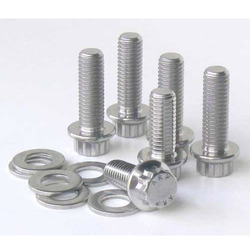 The offered stainless steel fastener is widely used for fastening two or more objects. Our supplied stainless steel fastener is appreciated by the clients, owing to the corrosion resistant body and high durability. The offered stainless steel fastener is easy to install and fix by using mechanical power. We are one of the leading manufacturers, exporters, suppliers, importers, wholesalers and traders of Carbon Steel Fastener. The offered carbon steel fastener is very widely used for fastening and fixing of two objects. Our supplied carbon steel fastener employs the mechanical fastening technique for ensuring strong and long lasting joints. The offered carbon steel fastener is made from rust resistant carbon steel body. We are one of the widely acclaimed manufacturers, exporters, suppliers, importers, wholesalers and traders of Duplex Steel Fastener. The offered duplex steel fastener is very versatile mechanical device for joining or fixing of two objects. Our supplied duplex steel fastener is capable of ensuring, perfect fitting and attachment. The offered duplex steel fastener is available at very affordable and cost effective market rates. Looking for Alloy Steel Fasteners ?